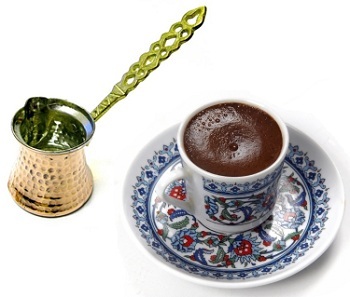 Home ♦ Coffee ♦ What is Turkish coffee? Turkish coffee is a favorite type of coffee among coffee lovers, but it is one of the less common ways to prepare coffee and you aren’t going to encounter it in your average coffee shop. Turkish coffee starts with ultra-finely ground coffee beans, which are boiled with water in a small pot until the mixture becomes foamy. It is then poured out into a small cup – grounds and all – and sugar or honey is added to taste. Some methods call for adding sugar to the grounds, but most cafes will allow you to add the sugar on your own after you order a cup. The grounds are allowed to settle to the bottom of the cup, while you sip the hot coffee off of the top. Coffee made this way has an intense flavor and it becomes stronger as the coffee sits, as the grounds are still in the cup. The foamy head is a signature of turkish coffee, and while it can look similar to the crema on espresso, it is typically less creamy and much darker in flavor. It’s a great way to try coffee, especially if it is being prepared for you in a traditional pot, but drinking with the grounds in the cup takes a bit of practice or you’ll end up sipping some of the sandy grounds as you come below the halfway point.